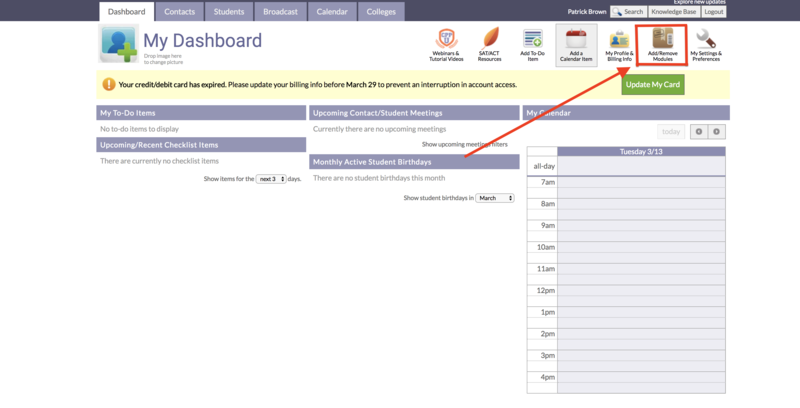 There are only a few steps to integrate your CollegePlannerPro account with Prompt. 1. From your dashboard, select the Add/Remove Module button. 2. Scroll down until you see Prompt Platform Integration and click Enable Prompt Module. 3. A confirmation screen will appear. Once you click Enable Prompt Integration Module, Prompt will be integrated with your CPP account. 4. Click on the "Students" tab and then the Prompt logo in the top right corner to access Prompt. You'll go through a few short questions to create your Prompt account.